Lilia Ginzberg was born in Liepāja, Latvia, in 1898. She moved to Moscow in 1914 to study law. While a student she became a supporter of the Mensheviks and disagreed with the decision of the Bolshevik government to close down the Constituent Assembly. In 1923 Lilia moved to Berlin where she married Samuel Estrin. When Adolf Hitler gained power in 1933 they moved to Paris where they associated with a group that supported the Left Opposition in the Soviet Union. This included Lev Sedov, the son of Leon Trotsky, Victor Serge and Mark Zborowski. Together they published the Bulletin of the Opposition, the journal "which fought against Stalinist reaction for the continuity of Marxism in the Communist International". She also worked as a secretary for Boris Nicolaevsky at the in Amsterdam, repository of the archives of the Socialist International. Lilia Estrin became Sedov's secretary. She wrote to his mother, Natalia Sedova: "I work like an ox, from early morning to late into the night, and I am content. My job (with the Institute) is interesting. After it, I work for the Bulletin and other (Trotskyite) matters which keep me up until one o'clock at night. At seven in the morning I am up again... I need no Sundays, no respite. I am a dynamic person, I need action." According to Robert Service, the author of Trotsky (2009), some of the group were highly suspicious of Mark Zborowski (Etienne): "His story was that he was a committed Trotskyist from Ukraine who had travelled to France in 1933 to offer his services. He retained Lev's complete confidence despite the reservations expressed by French comrades. Etienne aimed to become indispensable to Lev, and he succeeded. Cool-headed and assiduous, he relieved Lev of many tasks in a heavy workload. Not everyone took to him. It was far from clear where he got his money from or even how he managed to subsist. Lev's secretary Lilia Estrin sympathetically invented jobs for him to do and paid him each time he did one of them. A routine was established: Etienne worked alongside Lev in the mornings and Lilia took his place in the afternoons. Equipped by his handlers with a camera, Etienne photographed items in the organization's files.... Etienne's growing prominence in this situation gave rise to suspicions among French Trotskyists." Pierre Naville mentioned his worries to Trotsky, who retorted: "You want to deprive me of my collaborators." Walter Krivitsky was an NKVD agent who decided to defect after the recall and execution of agents such as Theodore Maly and Vladimir Antonov-Ovseenko. He arranged to meet Lev Sedov in the company of Fedor Dan and warned him that there was an informer within his group. Krivitsky suggested that it might be Mark Zborowski. According to Gary Kern, the author of A Death in Washington: Walter G. Krivitsky and the Stalin Terror (2004): "Krivitsky had no desire to join the Trotskyists, but was impressed by Sedov, admiring his revolutionary fervor, hard work and austere life style." Victor Serge has pointed out that towards the end of 1937 Sedov suffered from ill health. "For several months Sedov had been complaining of various indispositions, in particular of a rather high temperature in the evenings. He wasn’t able to stand up to such ill-health. He had been leading a hard life, every hour taken up by resistance to the most extensive and sinister intrigues of contemporary history – those of a regime of foul terror born out of the dictatorship of the proletariat. It was obvious that his physical strength was exhausted. His spirits were good, the indestructible spirits of a young revolutionary for whom socialist activity is not an optional extra but his very reason for living, and who has committed himself in an age of defeat and demoralisation, without illusions and like a man." Leon Trotsky was devastated by the death of his eldest son. In a press release on 18th February he stated: "He was not only my son but my best friend." Trotsky received information from several sources that Mark Zborowski was an NKVD agent. 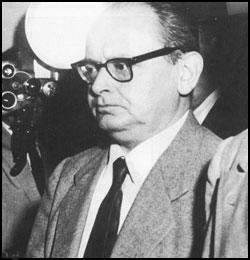 He asked Rudolf Klement to carry out an investigation of Zborowski. According to Gary Kern "Klement put together a file and planned to take it to Brussels on July 14, where he would circulate it among various branches of the Opposition. But no one in Brussels ever saw him." Klement's headless corpse was washed ashore in August 1938. He was identified by a friend from peculiar scars and marks on the body. When the German Army invaded France in May 1940 Lelia fled to the United States. Soon afterwards she married David Dallin. A few months later Mark Zborowski arrived in New York City. He immediately contacted the Dallins. They helped him find employment at a factory in Brooklyn and set him up in an apartment. A few months later he moved to a more expensive home at 201 West 108th Street, where the Dallins also lived. It was later discovered that the NKVD were paying Zborowski to spy on the Dallins. Lilia Estrin Dallin died in 1981. After the death of his son, Lev Sedov.... Trotsky received an anonymous letter warning him that a spy named Mark had infiltrated the Parisian group. The letter was sent by Alexander Orlov; defected in July, who knew about TULIP's work while in the service. Lilia Estrin was with Trotsky in Mexico when he read the warning in 1939, but both of them discounted it because other letters (probably sent by the NKVD) had warned Trotsky against other intimates of his circle, including Lilia. Blinded by the shotgun attack, Trotsky was undone: he realized that he could not spend all of his time investigating every member of his staff, yet failure to do so would leave him defenseless against infiltration. Even though he believed that his son had been murdered by the NKVD, he refused to act on the letter; Lilia returned to Paris and told Zborowski all about it. At the beginning of July 1954, Orlov received a letter from David J. Dallin, an author who claimed to be writing a review of Orlov's recently published book and who was also writing his own book, for which he wanted Orlov's advice. Dallin was no stranger to Orlov, and his wife Lilia was known to Orlov as a Trotskyite who had had a close association with Lev Sedov and the Paris organisation. There was no doubt that she would have known Mark. Orlov agreed to a meeting with Dallin at the Wellington Hotel in New York on 6 July, which excluded Lilia. Orlov and Maria met Dallin as planned and chatted with him briefly in the lobby of the hotel. Maria, as cautious as ever, noticed an individual who seemed to be taking more than a casual interest in the three of them, so the meeting was terminated. Maria arranged for a taxi and the group resumed their meeting at a nearby restaurant. Orlov recalled the meeting as very strange. Both he and Dallin were very reticent and cautious, until Orlov finally broke the ice and asked Dallin if he knew "Mark, the agent provocateur" in Sedov's Paris organisation. Dallin replied in the affirmative and asked if Orlov knew Mark's last name. Orlov replied that he did not, to which Dallin asked if the name Zborowsky was known to him. After Orlov's negative reply, Dallin asked if he had ever seen Mark. Again Orlov feigned ignorance. Dallin then suggested that there had been two Etiennes - one of whom wrote his column under that name - who had worked on Trotsky's Bulletin of the Opposition in Paris and that Orlov might be confused about his facts. Orlov now felt that it was Dallin who was confusing the issue. Orlov asked if he knew the present whereabouts of Mark, but Dallin stated that he did not. Orlov suggested that, in recognition of Mark's dedicated service to the KGB and because of his Polish background, he was probably holding down a high-level position with the KGB in Poland. Maria ventured that Mark had probably been stranded in France during the German occupation of Paris. Dallin replied that Mark had been able to get out of France, thus revealing that he knew far more than he was saying. More than ever Orlov was convinced that Zborowsky was Mark. What transpired next came as a shock to Orlov. Dallin suggested another meeting as he needed advice from Orlov on his own book. He also added that he would see to it that his wife would not be present; however, Orlov retorted that he had no objection to her presence. They agreed to meet at Dallin's Central Park West apartment on Christmas Day. At the start of the meeting, Lilia Dallin again offered the scenario that there had been two Etiennes and that this must have confused Orlov. However, Orlov insisted that he knew of only one Etienne, that being Mark. Dallin sensed that they had got off to a bad start and signalled to Lilia to get off the subject of Etienne; he also verbally admonished her that the matter was irrelevant. Orlov knew that he had to demonstrate that he was totally aware of Mark's spying activities in Paris. He related several incidents that would have been known only to Mark and the KGB as well as those in very close contact with Mark. One incident he related completely crushed Lilia as it would have been known to her and Mark alone. During Sedov's last illness, he had been confined in the clinic in Paris where the Chief of Staff was a female doctor by the name of Ginsburg, whose husband was Lilia's brother. During his illness, Sedov had had an urge for an orange, and it was Lilia who had provided Lev with one, a fact that was known only to Mark. Mark had related the incident in his KGB report, specifically mentioning that it had been Lilia who had provided the orange for Lev. Lidya looked horrified at the reference to the orange and immediately responded that she now knew that Orlov was telling the truth and was fully aware of Mark's KGB role. Lilia retreated to the kitchen to make some tea while Maria followed to make sure that no poison was added to their cups. Still in shock, Lilia blurted out that she and her husband had got themselves into a grave situation as they had been responsible for bringing Mark to the United States, where he still resided. Lilia also acknowledged that she had been in Trotsky's household in Mexico as one of his secretaries at the time Orlov had made his attempt to speak to Trotsky from San Francisco. Maria rushed back to the living-room to inform her husband of these facts. Orlov couldn't wait for the following Monday, 27 December, for the federal offices in Foley Square to open in order to report the presence of a known KGB spy in the United States. He presented his information to United States Attorney Boudinot Atterbury, who immediately summoned the FBI. What the Dallins revealed on that eventful Christmas Day in 1954 was confirmed later during US Senate Subcommittee on Internal Security hearings held in September 1955. Placed on the record was a statement previously made by Dallin, which asserted that his wife had known Zborowsky since 1935 and he had become acquainted with him a few years later. They had continued the relationship through to 1953. Zborowsky had been born in Uman, Russia, but during the Russian Revolution his family had escaped to Lodz, Poland, where he had grown up. Zborowsky had become a Communist and was arrested in 1930 for his Communist activities. He was placed on bond but escaped to France. Dallin believed that it was then that Zborowsky was recruited into service for the KGB and that he had entered France on forged documents provided by the KGB. Around 1933 to 1934, he was given the task of infiltrating Trotskyite organisations in Paris and continued in this capacity until the outbreak of the Second World War. He was successful in his efforts and became Lev Sedov's trusted confidant. When Sedov fell ill in February 1938, the identity of the hospital to which he was taken was reported to the KGB by Zborowsky. A few days later Sedov died but, according to Dallin, there was no proof that the death was other than natural.